Horizontal, vertical, chunky or fine, we love us some stripes at Vavavoom. An easy and chic wardrobe staple, these lined lovelies work all year round in a variety of wardrobes. And best of all, our favourite celebs are bending all the rules this season to mix stripes on stripes to give them a fresh new feel. 1. Mix different stripe widths a la Olivia Palermo’s front row look at this year’s Paris Fashion Week. She paired a wide-leg trouser and loose fitting shirt of a contrasting width and boom – perfection. 2. Blend thick with thin to achieve a look as stylish as Sienna Miller’s double stripe skirt and blouse. 3. Mix horizontal and vertical or colour and texture as shown by Jamie Chung. Plus there’s no need to save your best stripes for the yacht, here’s our guide on how to be the star in stripes at the airport, in college or for any special occasion. Take your stripes out to party in this box pleat skater dress. Its French and flirty and looks amazing paired with barely there sandals or a leather jacket to add a bit of edge. 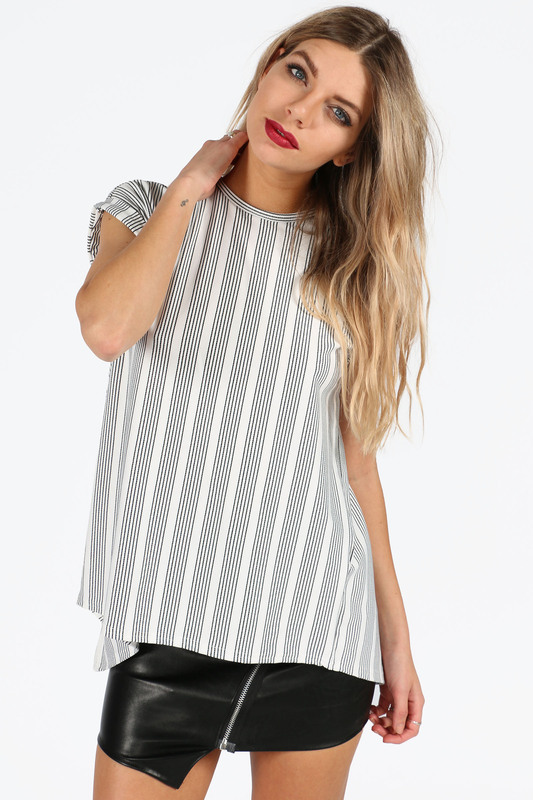 We think this monochrome striped cap sleeve winged back top is a college credit. Team it with your favourite skinnies or a leather mini and your coolest trainers to look great on campus. This look is a perfect example of airport chic. We have added a striped blazer to our must have leather look leggings and oversized handbag so you can walk the runway in style. Or take this monochrome striped scalloped hem top on a coffee date. Just add boyfriend jeans and a fedora for a laid back look. So let’s do this thing and join the stripe hype! !